James Cameron left an indelible mark on the summer of 1991. Terminator 2: Judgment Day effectively transitioned his skillset to the realm of mega-budget blockbusters. As it set up a benevolent dictatorship at American multiplexes, Cameron offered moviegoers another, even more potent shot of adrenaline. This time he merely served as producer while someone else administered the injection. He vacated the director’s chair for his ex-wife Kathryn Bigelow, who proceeded to make a “guy movie” better than any guy could have made it. Though her genius would be roundly dismissed at the time, it would be recognized 18 years later when filtered through the conventions of the modern war film. 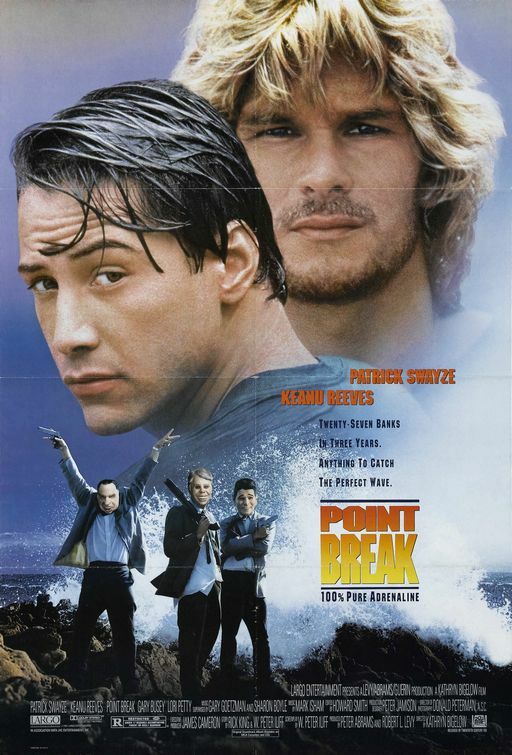 Its 1991 incarnation was fittingly titled Point Break. After a knee injury prematurely ends his college football career, Johnny Utah (Keanu Reeves) finds solace within the F.B.I’s bank robbery division as a special agent. He is stationed in Southern California and partnered up with Angelo Pappas (Gary Busey) a grizzled vet whose slovenly appearance hides a wealth of razor sharp instincts and valuable experience. The two are put on the trail of the Ex-Presidents, a crew of bank robbers who are the very model of brazenness and precision. They also happen to be surfers. Utah goes undercover into the world of surfing in hopes of seeking out and capturing his prey. In the process he finds an unlikely mentor and kindred spirit in the Ex-President’s leader, Bodhi (Patrick Swayze). Kathryn Bigelow made a couple of distinct genre pictures in the 1980’s. Near Dark was a western in vampire clothing, while Blue Steel allowed scream queen Jamie Lee Curtis to don a badge and gun. Bigelow specialized in action flicks that had a bit more going on beneath the surface than one would suspect. For the most part, they came and went at the Box Office, only to find a new life on home video and cable. Point Break would fare a bit better, since stars Keanu Reeves and Patrick Swayze both carried a considerable cache with the youth demographic of the time. Just as in Near Dark, Bigelow again zeroed in on a nomadic outlaw culture. This time, her subjects were bank robbing surfers. The protagonist, Johnny Utah, was fearless and instinctual. Both traits severed him well, but they were short circuited by youthful ignorance and shortsightedness. Bodhi possesses that same fearlessness, as well as an arrogant disdain for polite society. He and his gaggle of surfer dudes function more like a biker gang, sans the mean-spiritedness and modern day cowboy swagger. 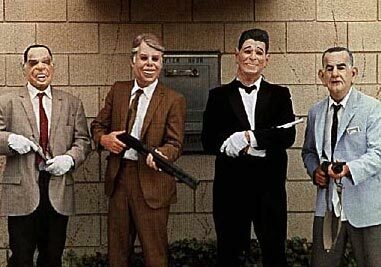 Point Break is rife with pseudo-spiritual subtext. Bodhi’s name is derived from the term Bodhisattva, which is an enlightened being who walks among mere mortals in order to help them achieve that same enlightenment. Bodhi is actually a functional ‘adrenaline junkie.’ His Buddhist pretensions allow him and his running buddies to indulge in all manner of extreme extracurricular activities. He senses those same tendencies in Utah, and begins reeling him in. The spiritual subtext and the films dialogue have been the subject of much derision and “ironic love” at the hands of fans. Much of that is due to the ludicrously staged yet undeniably thrilling set pieces which involve skydiving, shootouts, and an extended foot chase. Like the films characters, Bigelow dives in head first. The action is in the Peckinpah/Hill tradition, with squibs bursting into liquid burgundy fireworks. The spiritualism is played completely straight, which invited snickers from the pseudo intellectuals in the audience. I’d like to think that the peanut gallery merely mistook the films sincerity for stupidity. Point Break endured both mixed reviews and the onslaught of Terminator 2: Judgment Day to eke out a solid box office gross of 83 million dollars worldwide. Though The Hurt Locker would provide a much more disciplined and sobering look at adrenaline addiction, Kathryn Bigelow’s fascination with that particular ailment begins here. Action movies are all about appeasing the jones that Point Break examines, but comes to no real conclusion about. Though it doesn’t quite achieve the nirvana it seeks, it’s still an example of the kind of film Michael Bay might do if he actually had a brain or a heart. Rest in peace Bodhi, and Happy Birthday Johnny Utah.